Terrified, Khan's wife said the men did not disclose their identities and refused to say why her husband was being taken away. Khan's tragic story began on December 31, 2009. He had been working as a journalist in the capital, Islamabad, leaving his family back home in Waziristan. On New Year's Eve, he got an urgent call from his family: their home had just been struck by a US drone, and three people were dead; Kahn's 18 year-old son Zahinullah, his brother Asif Iqbal and a visiting stonemason who was working on the village mosque. 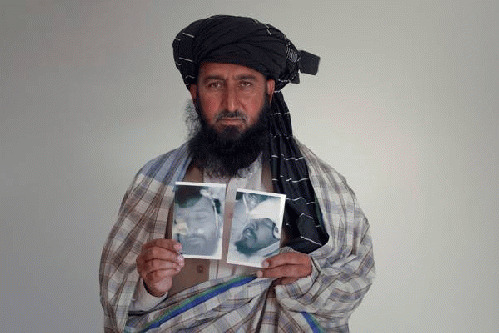 The news reports alleged that the target of the strike had been a Taliban commander, Haji Omar, but Khan insisted that Haji Omar was nowhere near the village that night. Khan also told us that the same Taliban commander had been reported dead several times by the media. "How many times could the same man be killed?," Khan asked. Khan's son had just graduated from high school, and his brother was a teacher at the local school. Khan's brother taught his students that education was far more powerful than weapons. The drone strike that killed th eir teacher taught the students a very different lesson. Speaking outside a police station after he had lodged a legal complaint, Khan asked that Jonathan Banks, the CIA station chief in Islamabad, be forbidden from leaving Pakistan until he answered to the charges against him. (While CIA agents' identities are secret, Banks' name had been revealed in the local press.) While the accusation against Banks made headlines in Pakistan, the CIA chief was allowed to flee the country. But in the ensuing months, Khan organized other families of victims and jointly, they have been pressing their cases in several lawsuits now pending in Pakistani courts. Khan has obviously been an embarrassment to the US government, which is responsible for the drone strikes. And it has put the Pakistani government in an uncomfortable position. On the one hand the Pakistani government--from Prime Minister Zardari to the legislature--has come out publicly against the US use of drones. But Pakistan is heavily dependent on US aid and the government has been unwilling to bring charges against the US in international bodies or send an irrefutable rebuke by shooting down a US drone. Given the political backroom deals that have obviously been going on between the US and Pakistan, Khan took great risks by speaking out. "Kareem Khan is not only a victim, but an important voice for all other civilians killed and injured by US drone strikes," said Khan's lawyer Shahzad Akbar, who is also Director of the Foundation for Fundamental Rights . "Why are Pakistani officials so scared of Kareem and his work that they felt the need to abduct him in an effort to silence his efforts?" "We are extremely worried about Kareem Khan, a gentle, warm man who opened up his heart to us when we were in Pakistan," said Alli McCracken, who was on the CODEPINK delegation. "We have launched a campaign to free him, flooding the Pakistani Embassy and State Department with calls." You can add your voice to the call to free Kareem Kahn by signing this petition , which will be hand-delivered to Pakistani and US government officials.